We offer two types of airport services. Private SUV Taxis and Shared Airport Taxis. 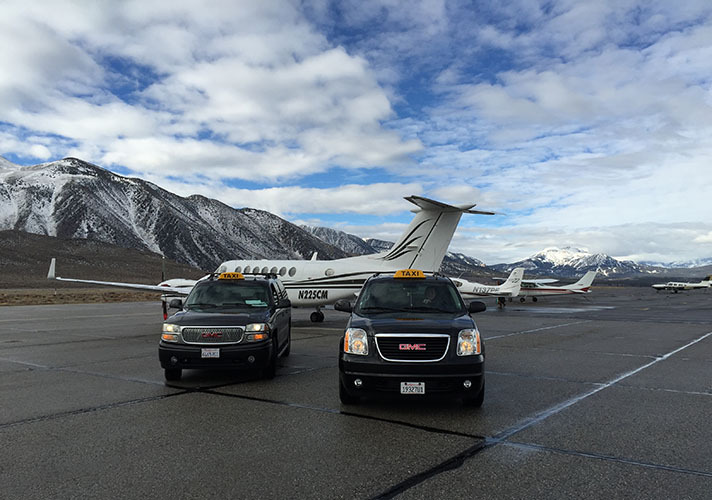 Private SUV Airport Taxis are available year round and available for both Commercial and Private flight services at Mammoth/Yosemite airport. Private SUV Taxis offer exclusive transportation for 1-7 people starting at $60.00 to and from the airport. The Shared service offers door to door transportation for 1-7 people at $22.00 per person. Shared SUV Airport Taxis are only available from December to April and are Closed for the season. All advanced reservations for airport services must be made on the website. Reservations can be requested on the website up until 6:00 PM the day before travel. All transportation needs for the current day must be requested by telephone. Please check our rates page for current pricing. Travel in style using our Private SUV Taxi to and from the airport. Separate reservations must be made for your arrival and departure to guarantee exclusive service. 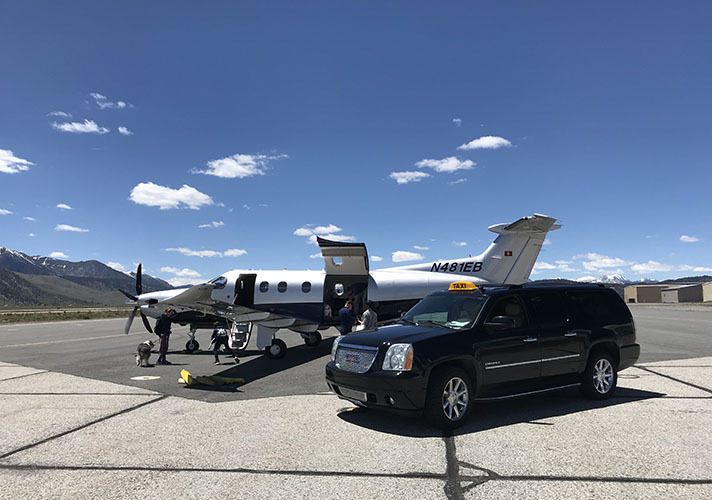 This service can be used for both commercial flights and private flights to and from Mammoth Yosemite Airport. Your driver will be waiting to greet and assist you when you land. Then you're off to your selected destination. We offer a 5 minute courtesy stop on the way for such things as a key pick up if needed. 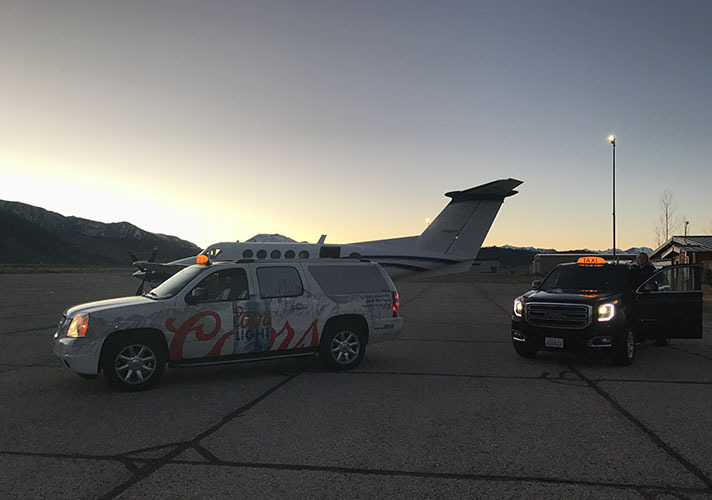 When scheduling your departure from Mammoth Lakes on a commercial flight we recommend a pick-up time of 1.5 hours before the scheduled flight departure. Our shared airport taxi service for commercial flights is Closed for the season. We will begin shared services for the airport next season in December. 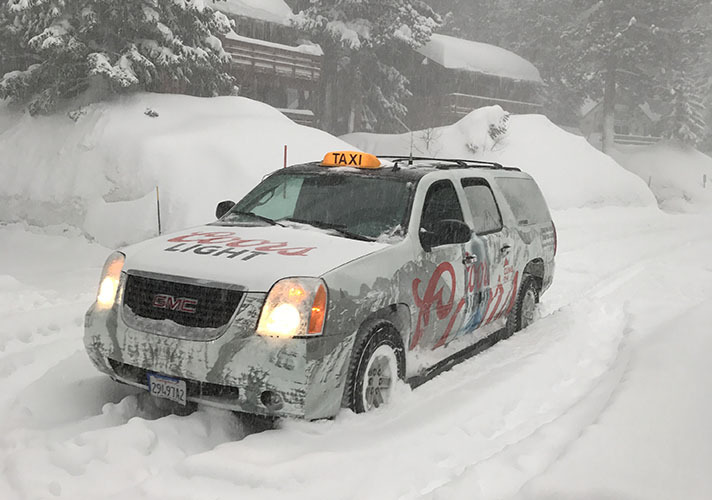 The Shared Airport Taxi services transfers between Mammoth Yosemite Airport and the town of Mammoth Lakes for the scheduled commercial flights during the Winter. Reservations are recommended to ensure that you will have transportation for your arrival and departure. 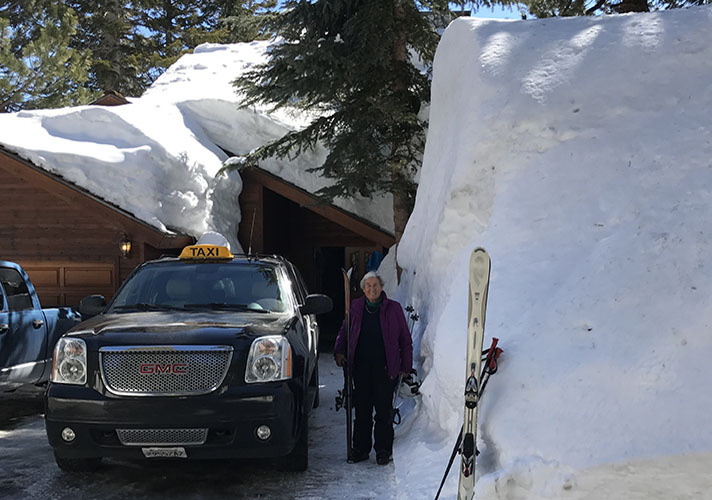 Please check in with Mammoth Taxi when you arrive. We are located outside at the baggage claim area of Mammoth Yosemite Airport. Departure pick-up times are emailed upon confirmation and are determined by Mammoth Taxi in order to make sure all guests arrive at the airport in time to check bags and get boarding passes. Additional stops in town are not available with the Shared Airport Taxi Service. 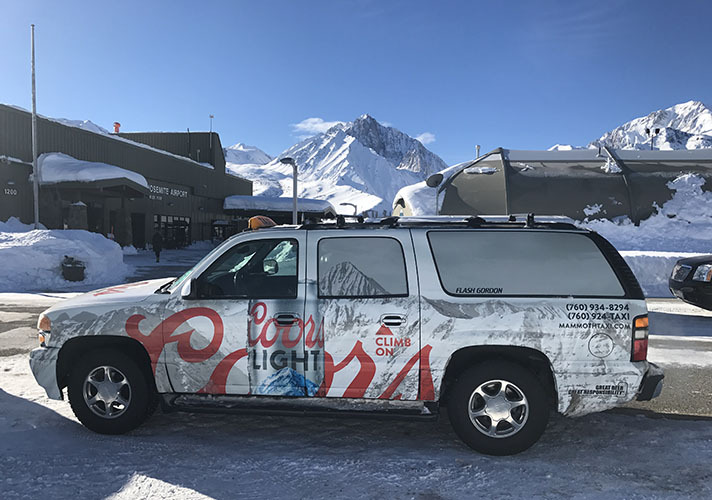 Our Private SUV Taxis are a great way to travel in luxury when visiting Mammoth Lakes and the Eastern Sierra. We offer transportation for Airport Services, Weddings, Scenic Tours, Special Events and of course by the hour if it’s just for a night on the town. Our website offers options for airport reservations and car service by the hour. Please call our Main Office to coordinate services for any special occasion or event. We offer transportation for long distance transfers throughout California and Nevada. 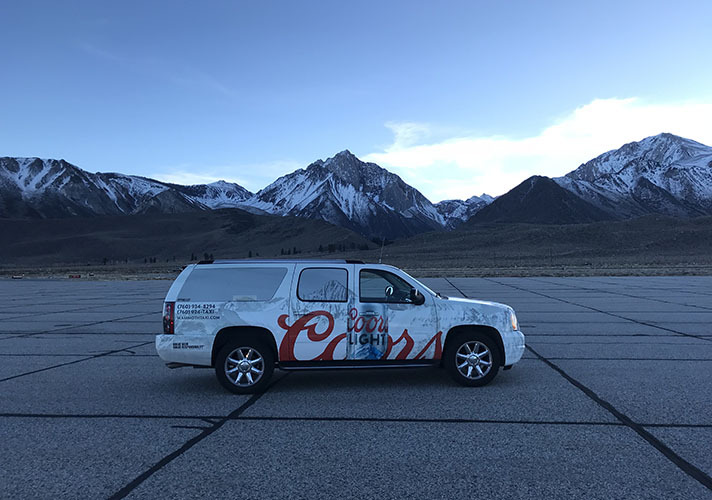 Our fleet of 7 passenger vehicles can be reserved all year long to transfer you and your guests in comfort to many destinations from Mammoth Lakes. Please see our rates page for our current pricing. Please visit Long Distance Reservations to make a reservation. Call our Main Office for unlisted destinations or special requests. 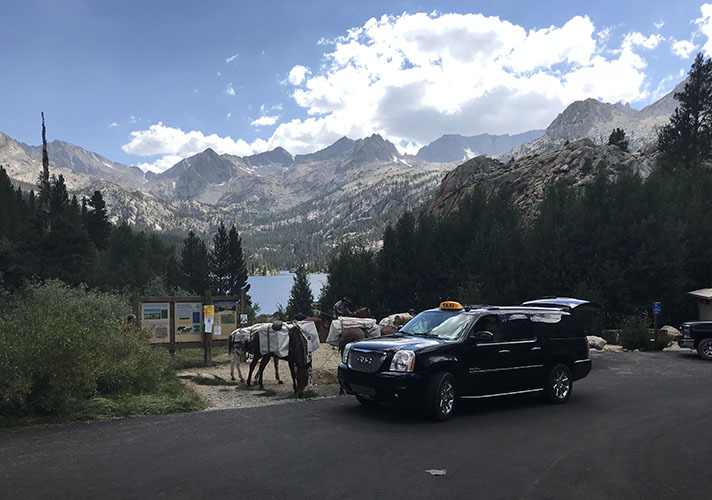 Our Trailhead Taxis provide convenient transfers for Hikers and Backpackers throughout the Eastern Sierra. We provide transportation for the entire John Muir Trail from Yosemite Valley to Mt. Whitney and all points in between. We also service Sonora Pass, Mono Village, Virginia Lakes and many other trailheads. We recommend using the Trailhead Transfer at the beginning of your trip. This is the best way to utilize the service. Park your vehicle at your finishing trailhead and have Mammoth Taxi drive you to your starting trailhead. Then hike back to your vehicle which is waiting for you when you finish. Please call our Main Office to discuss your needs or add a location if it isn’t listed as a Trailhead Transfer on the website. Please call us for door to door taxi services at either of the numbers below. We operate every day for on call taxi service from 8:00am- 2:00am. Schedules may vary in the shoulder seasons. We look forward to your ground transportation needs. Please book your Airport Transportation, Hiker/Backpacker Trailhead Taxis, or Long Distance Taxis on our website or give us a call at 760-937-8294 to speak to us directly about your needs. Our goal is to provide friendly, safe, reliable taxicab services, exceeding your expectations. Copyright 2009-2015 Mammoth-Taxi.com, All Rights Reserved.